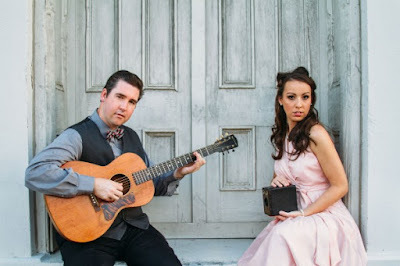 Mountain Home Music Company announces new music from acclaimed husband/wife Bluegrass duo Darin and Brooke Aldridge. FASTER AND FARTHER, their sixth CD for the label, is due in stores on February 10. The first single is now available on iTunes with your pre-order purchase. While not a thematic album, FASTER AND FARTHER, uses natural landmarks as metaphors for the heart and presents an inspiring project from masters of the genre. "Mountains Of Mississippi" spotlights the undeniable power of Brooke's vocal command complimented by guest vocalist and Country Music Hall of Famer, Vince Gill. "This River" is an impressionistic spiritual ballad with Darin on lead vocal. "Cumberland Plateau," written by John Cowan and Darrell Scott, syncs three-part harmony into a longing for heart and home. Cowan brings his bass groove and trademark vocal to several cuts, including "Lila" from his days with New Grass Revival. "Fit For A King" is one of several Gospel music inclusions that are an important part of the band's heart.